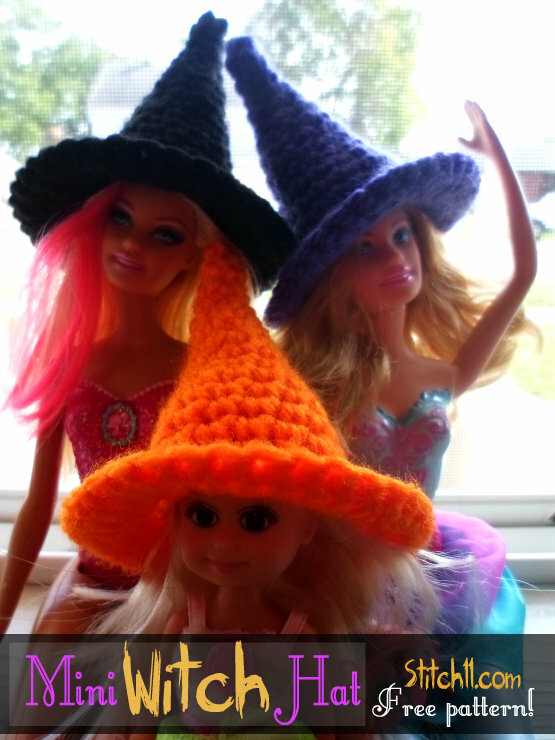 The mini witch hat can be used for many things- barbies, hanging decoration, sucker cover, and anything else your creative mind can think of! They are very easy and quick to work up. Have fun with this free Stitch11 pattern! Round 1: Magic Circle, 4 SC into magic circle. Pull ring tight and join to first SC. Finish off and weave in your end. I love this pattern! I’m making a witches hat garland for Halloween and I’m playing with beading on the next one. I was wondering if I could get your permission to teach this as a class. I teach crochet classes in Danville, CA and I thing this would be such a fun class for my students. Please let me know!